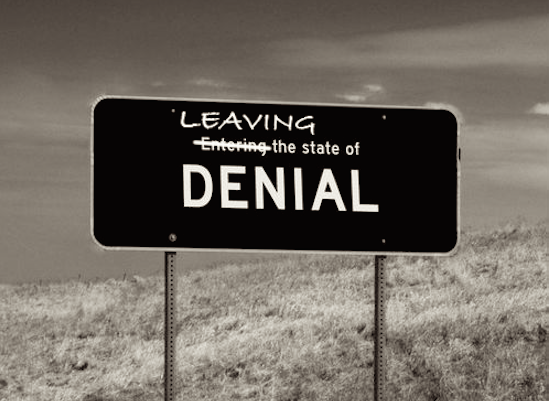 Don’t you just love being in Denial? That wonderful place where all you have to do is show up for work, do the same old, same old… and everything just keeps on ticking along. Isn’t it so cool to wake up in the morning and proclaim to the world that you’re just so excited to plonk your behind down in your tried and trusted swivel chair and keep those lovely green lights staying on? Two years is real, it's a time span that impacts us all today, not one where we are procrastinating, or simply leaving the problem to someone else, once we have left our current job. By why now? What's wrong with a few extra years wallowing peacefully in Denial? Social media is leaving us with nowhere to hide. Let's face facts here - RPA technology, by and large, is nothing new - much of it has been around for the last decade and beyond. "Cloud" has been around for so long, we've almost forgotten about it. Cognitive tools are still largely smart macros and algorithms (again, nothing new), while Rolf Faste was harping on about Design Thinking to Stanford students in the 1980s. The reality, today, is that we're educating ourselves (and hyping ourselves) at a breathtaking daily pace and, suddenly, if you don't have an automation strategy, are tinkering with cognitive capability and have some clue how to make your enterprise behave more "digitally", then you are officially legacy. The way we think, operate, manage and communicate is becoming brutally exposed - in almost every business situation with which we deal. If you are behind the curve, everyone knows it very quickly and you are typecast as the walking corporate dead. There is nowhere to hide, people... it's time to purchase that one-way ticket out of Denial, before that long-awaited career move making sandwiches becomes your future. Offshoring never was a permanent solution, it's part of the gearbox of value levers. Remember all those times we debated the accidental "career" that is outsourcing? When shifting back office work to cheaper labor pools around the world was a special skill, a unique capability that only a very select group of us, endowed with this blessed experience, could boast? What we weren't really considering, back in Denial-day, was that offshoring work was only the first phase in a quest for better efficiency and value. Just because you signed a five year deal to shift the work of 500 headcounts to a be carried out at lower cost elsewhere, didn't mean you weren't intending to search continually for new ways to innovate in the future? 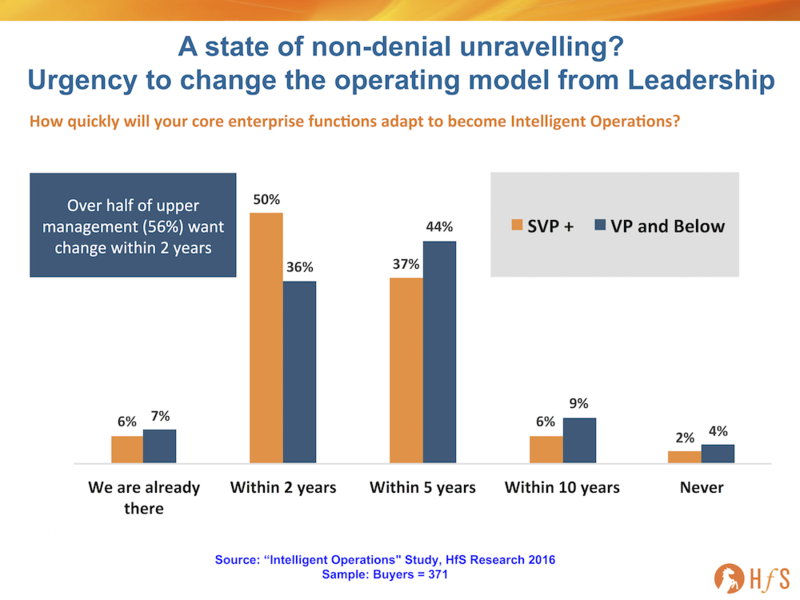 Most enterprises that have outsourced IT and business process work today are already putting real pressure on their operations leadership to commit to new, identified value levers, with an automation strategy being the prime lever that is the natural sequential transformation phase for most operations, whether or not they are outsourced. If there's one thing that we all need to stamp out, it's the pessimism and fear-mongering - most of it's unwarranted, unfounded and irresponsibility created by people who should know better. The reality is, we are dealing with some disruption to jobs, as automation, when implemented well, can reduce some transactional headcount (which we predict as having a 9% negative impact over the next five years, and will be largely offset by natural attrition and workers evolving their skills into other areas). In my view, the real threat comes in the form of disruptive competitors using digital platforms and cognitive computing that can wipe out your enterprise overnight. Imagine a new bank appearing, with a great mobile app, immediate customer service via chat / phone etc. Or a rival insurance firm that delivered everything you needed at half the premiums, but twice the usability? You'd switch in a heartbeat wouldn't you? And these capabilities are here today, they're not coming tomorrow. And also remember that the threat of legacy extinction is with mid/advanced career folks, not our kids... they'll always adapt and survive, as they have the digital skills and awareness to do what modern businesses need. It's the 35+ generation that needs to get with the program and grasp how to manage automation initiatives, how to understand a cognitive workflow, how to determine and execute a digital business model. It's the mature executives who have been basking far too long in the delights of Denial and must make a hasty exit to Optimistic Reality. I'm in denial reading that I'm not supposed to be in denial! Very good blog. You point about offshoring being "part of the gear box" is spot on. Why was this ever the permanent solution? It was purely a method to drive out excessive labor costs. I guess noone really thought at the time we would then look at ways to automated the work as the next phase. Denial? That's a river in Egypt right? 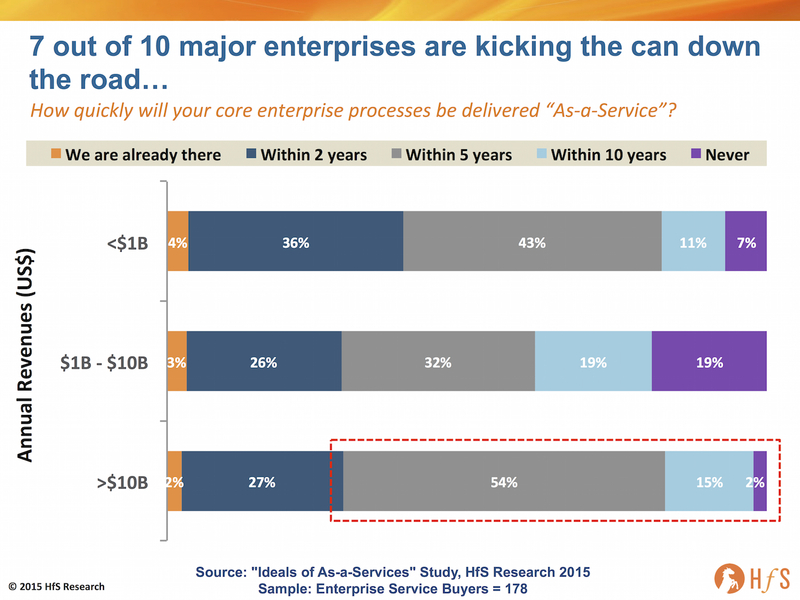 Sorry....Outsourcing should never be the end-game for process improvement. Who is to say that the 3rd party chosen is using best practice and innovative tools for example? Global markets shift continuously: what was once a low-cost country (e.g. India) rapidly becomes quite expensive as the demand outstrips supply, meaning alternative low cost options arise (e.g. Vietnam). The 3rd party will never recommend that, so it falls to your company. You've got to keep a finger on the pulse, particularly when it comes to technology.